An eighteenth century rococo dessert I created at the Bowes Museum in 1994 using a Chelsea botanical dessert service, Derby fruit baskets and figures. 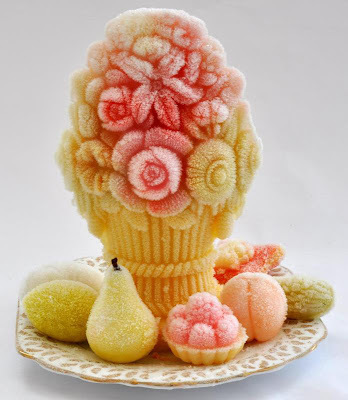 The sugar paste palace is surrounded by parterres filled with coloured sugar sands (sables d'office). 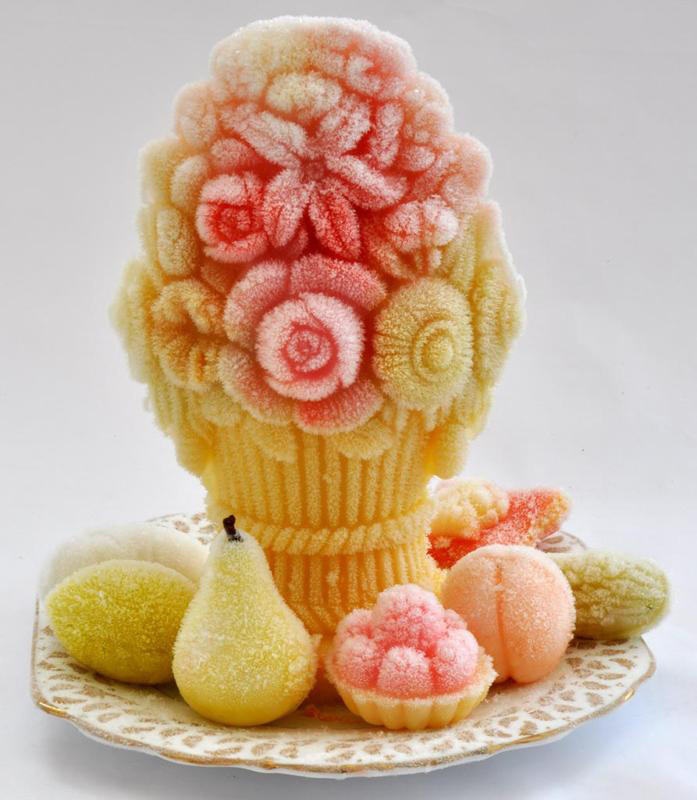 All the confectionery items are made from eighteenth century recipes. The panelling in the room was taken from Chesterfield House, which had the earliest rococo interior in England. 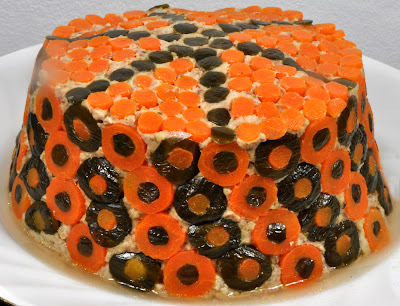 I have always been fascinated by the aesthetics of food and how it relates to prevailing trends in the mainstream visual arts of a given period. Dine in a good contemporary restaurant these days and your various menu choices will almost certainly be arranged rakishly on the plate with a garniture of gestural smears, dustings and drizzles. The prevailing aesthetic seems to be a culinary form of abstract impressionism. I had a nice lunch a couple of days ago in a promising new local brasserie. My starter was not quite an Arshile Gorky, my main course definitely a Willem de Kooning and my dessert a Mark Rothko, though painted crimson in coulis, sorbet and wild strawberry tuile rather than acrylics. But it must be said that what might seem like a cutting edge arrangement of food sitting on a dinner plate today will in a few years almost certainly look dated. 'Did we really eat like that?' you will probably ask, 'And did we really call it molecular gastronomy? How embarrassing!' Food is as subject to the vagaries of fashion as clothes, popular music and most other cultural manifestations. In the past, the prevailing styles of decorative art not only dictated the form and ornamentation, lets say, of a silver or porcelain dinner service, but frequently also the appearance of the food that was served on it. Some high status dishes in the medieval and early modern periods were not merely decorative, but adorned with images of allegorical, heraldic or religious significance. 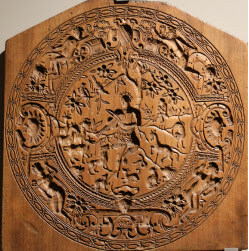 Witness the sixteenth century Portuguese almond paste mould below, carved with an image of Orpheus playing music to the beasts and birds - or the early modern French multi-purpose food mould with hunting scenes and coats of arms. 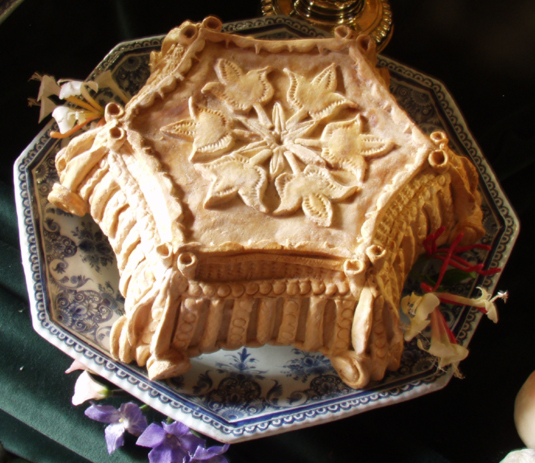 In the seventeenth and early eighteenth century, pies with incredible baroque pastry decorations similar to those on plasterwork and woodcarving were a common element at important feasts. 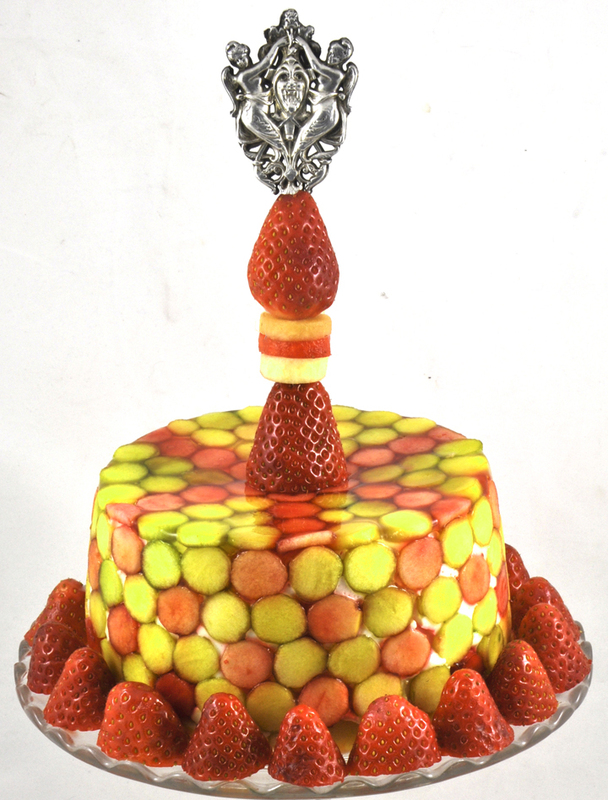 The pastry cooks who made these extraordinary food items possessed skills which were frequently as well developed as those of artists who worked in more conventional media. 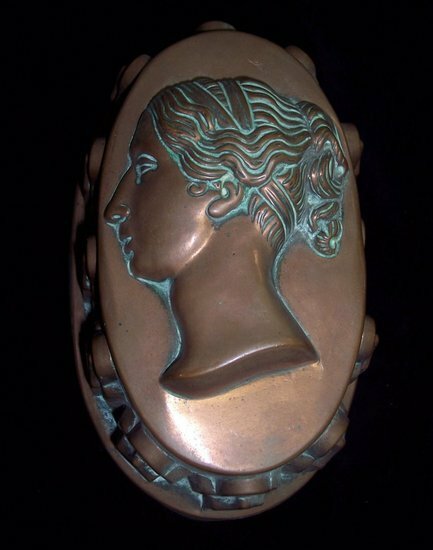 When the manufacture of food moulds started on an industrial scale in the nineteenth century, it was not just the wealthy who enjoyed artistically wrought food. Moulded dishes both savoury and sweet became fashionable at most levels of society. In the early Victorian period some diners even celebrated the accession of their young monarch with a jelly moulded in the form of her profile, rather like that on the celebrated penny black stamp issued in 1840. Nineteenth century English food was certainly intricate and highly decorated, as appearance was just as important as taste. 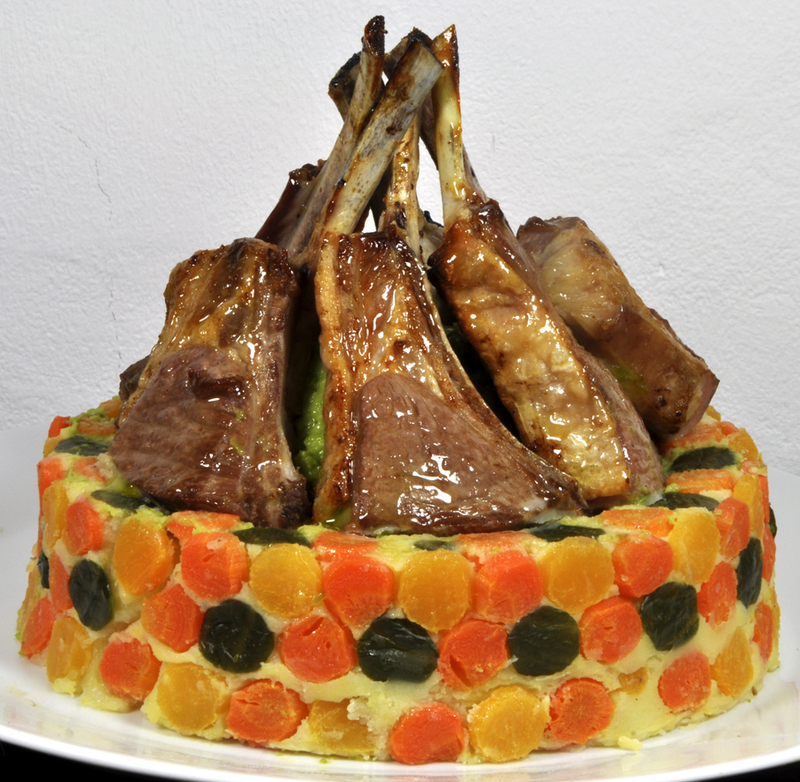 By the 1880s this highly ornamental style of cuisine was being practiced by home cooks as well as professionals. 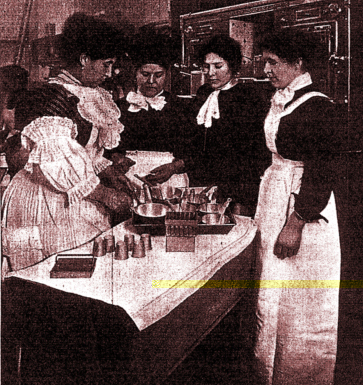 Cookery schools like that of Mrs Agnes B. Marshall in Mortimer Street, London were not only teaching housewives and domestic cooks how to make these spectacular dishes, but also sold you the necessary moulds, cutters and other equipment. So if you wanted to make the bundle of asparagus made of water ice like that above, you could not only buy the necessary moulds from Mrs Marshall's shop, but also learn the very tricky art of using them in one of her cookery lessons. By the way, all the food depicted in this post was made by me or by my students in my cookery classes. 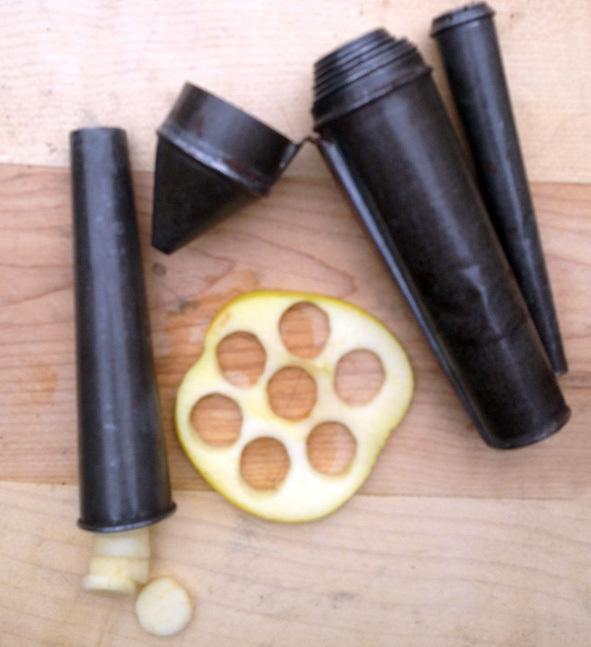 I can teach you how to make technically challenging dishes like this using original period equipment. So have a look at the courses page on my website. 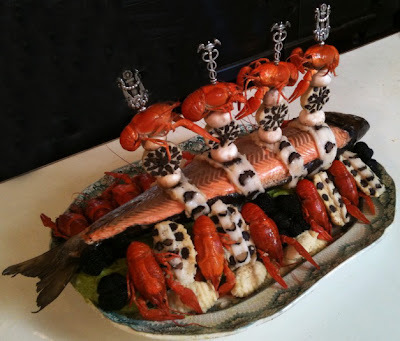 I have said that food presentation has always been subject to the influence of fashion, but it can also reflect more important issues, such as those of sensibility. For instance, the four ways of dishing up larks below, from Mrs Marshall’s The Cookery Book (London: 1885) may have looked appetizing and even charming to a Victorian diner, but a restaurant serving these little guys today would probably get a brick thrown through its windows. 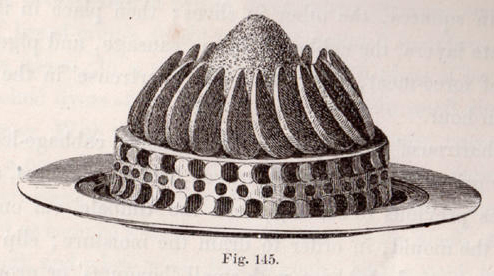 These steel engravings do illustrate just how food ornamentation has dramatically changed. The manner in which the food was actually served at table also had a profound effect on the style of presentation. Nowadays, restaurant food is delivered to each diner in the form of an individual plated-up serving, nicely manicured and tweaked by the chef. Mrs Marshall’s food was not designed for restaurants, but for serving in homes. Her dishes were cut up and served out at the table, so the aim was to have larger, often striking arrangements from which portions would be cut and shared out. Some of these dishes, especially the entrées and entremets, would look spectacular when first delivered to the table, but once attacked with a knife, the result would often be a mess. The salmon dish below, which I made from a recipe in Jules Gouffe, The Royal Cookery Book (London: 1868) with its ermine-like contised fillets of sole, truffled quenelles of whiting, whole truffles and crayfish looks far too amazing to eat! Such a pity to cut it all up and destroy the effect. Mrs Marshall died in 1905. Her fussy, highly ornamental food represented a style of dining that went back to the Second Empire and eventually to Carême. It was enjoying its final sunset in those years leading up to the Great War and she was one of its last advocates. A couple of years after her death Picasso painted Les Demoisseles d'Avignon and the world shifted dramatically on its aesthetic axis. Modernity kicked in and the presentation of food was inevitably influenced by the new zeitgeist. 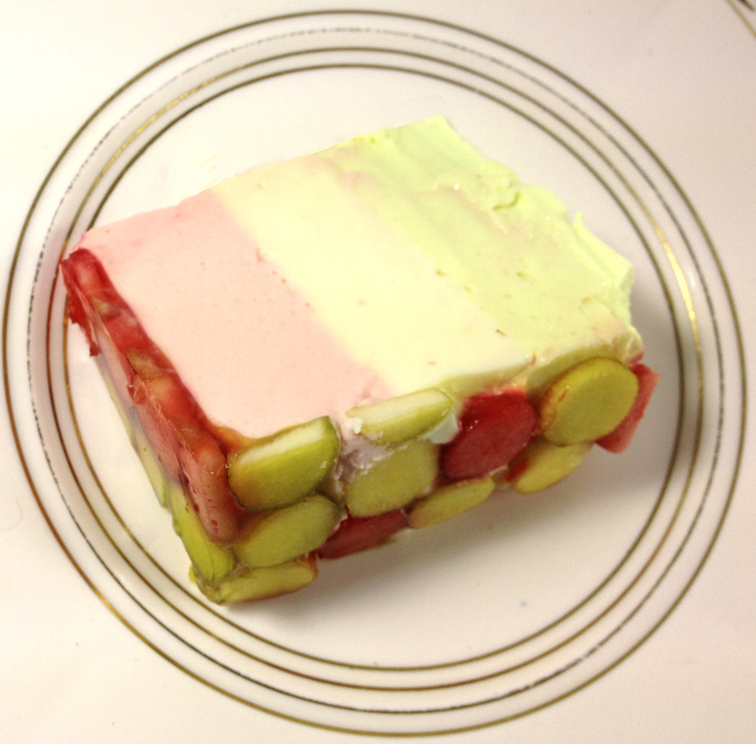 Minimalism in food presentation eventually triumphed over the highly embellished and figuratively moulded creations of the nineteenth century with their fussy garnitures. Skilled kitchen workers and servants who could work in this demanding labour-intensive genre also became scarce as a result of the Great War. In addition a stoicism in food matters set in through the influence of military culture and the privations of war. Fussy Victorian food started to look old fashioned and wasteful. Time-consuming dishes which required specialist moulds and a kitchen full of skilled servants lost their appeal. One highly decorative and technically demanding dish, which to me represents this lost culinary world, is the chartreuse. 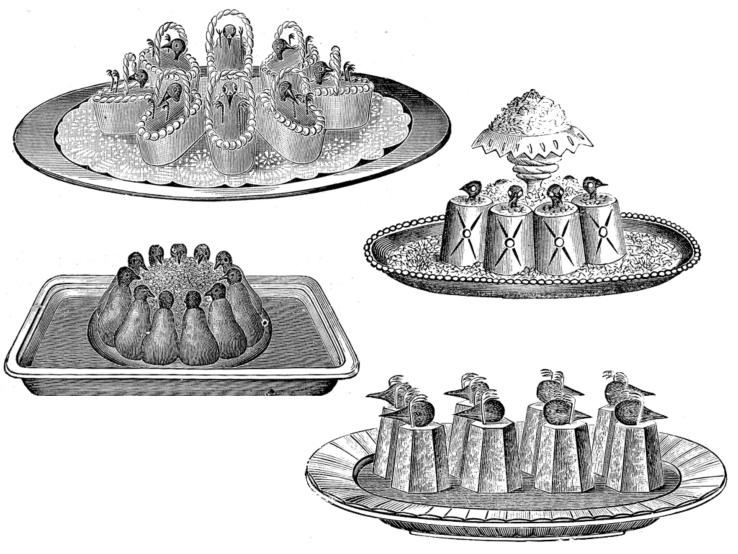 Antonin Carême offered recipes and illustrations of these spectacular creations in some of his books, and most other nineteenth century cookery writers follow suit. Originally they were savoury dishes in which vegetables cut into geometric shapes were used to line charlotte moulds. But there were sweet versions too. 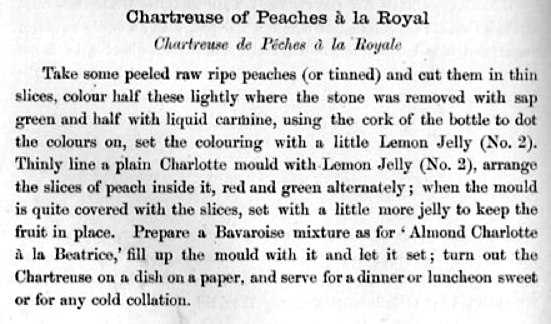 Here is one which I made a couple of days ago from Mrs Marshall's Cookery Book (London: 1885) called a Chartreuse of Peaches à la Royale. Marshall was a clever and very entrepreneurial bunny. 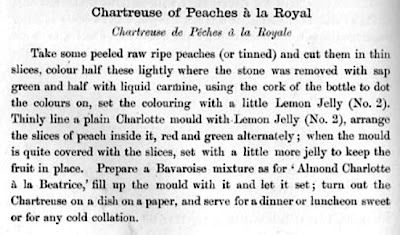 You will notice that in her recipe the bavaroise filling for the chartreuse is the same as that used in another of her dishes called Almond Charlotte à la Beatrice. Well this recipe is not in the same book. To get it you would have to buy her Larger Book of Recipes! She tells us to divide the bavaroise into three portions and colour them separately with her patent food colours of course- Marshall's carmine and vegetable green, which you had to buy from her shop. Apart from lunatics like me, very few cooks make chartreuses nowadays. You need the patience of Job, a fine sense of detail and an expensive collection of antique culinary equipment. If you do want to have a bash, here is a recipe from 1932 (Anon. The Illustrated Cookery Book) for an easy one and probably the last surviving member of its race - a banana chartreuse. Just go easy on the gelatine to get the softest set and mouthfeel and you will have made a spectacular and delicious dish. 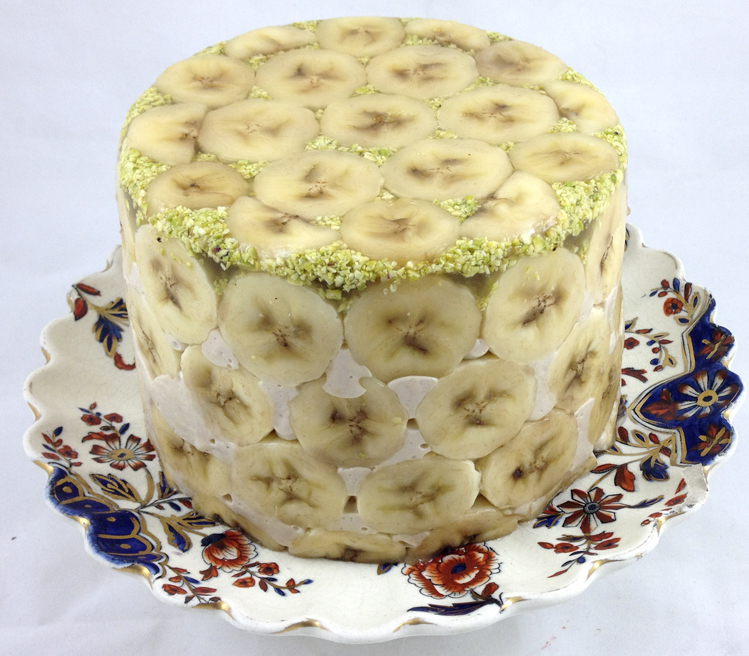 Banana chartreuse 1932 - no chefy drizzles or smears here! 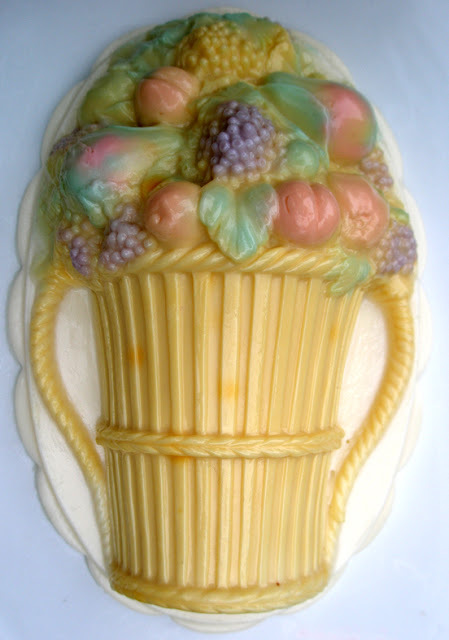 the sides of the moulds with the banana rounds and pistachio nuts in any pattern desired. 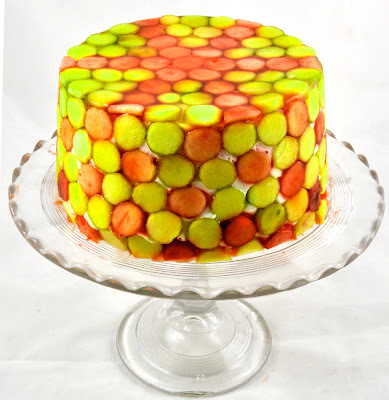 Set the decorations with a little clear jelly. Rub sufficient bananas through a hair sieve to make half a pint of puree. on ice until set. 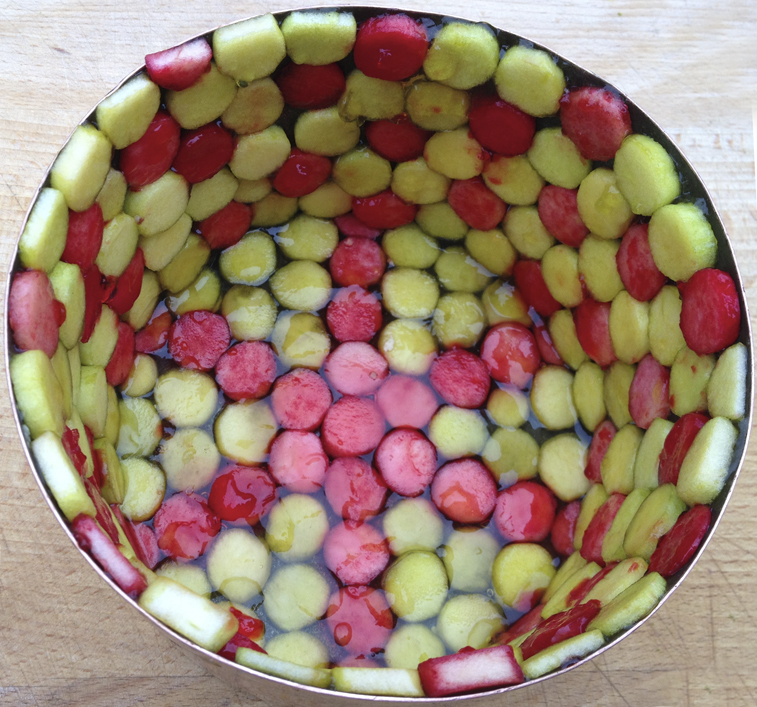 Turn out the mould on to a glass or china dish and garnish with a little chopped jelly. 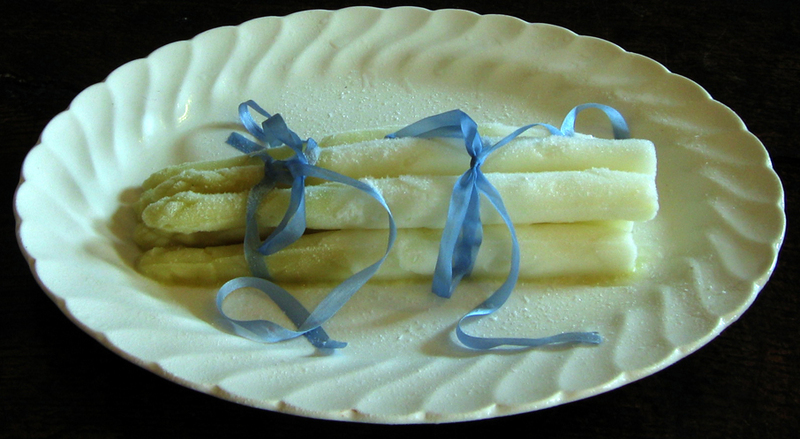 As well as sweet chartreuses, there were also many savoury ones like these below. A steel engraving from Urbain Dubois, Cosmopolitan Cookery. (London: 1870. Showing how a vegetable chartreuse was used to create a turban, in this case Fillets of Pigeons à la chartreuse. 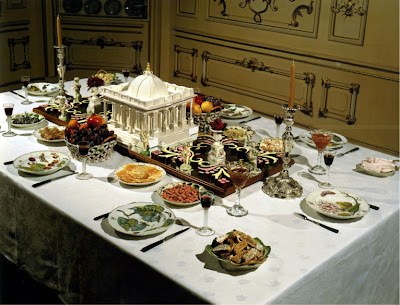 Listen to BBC Radio 4 programme on food and art - Architects of Taste - available until 22 March 2012. Presented by Ian Kelly with contributions by Roy Strong, Anne Willan, Ferran Adria, Jane Asher, Ruth Cowan and Ivan Day. Some of Ivan's contributions to this programme were chosen by Simon Parkes for BBC Radio 4's prestigious Pick of the Week programme. I have always thought that a chocolate smear on my dessert plate not only looks awful, but it depresses my appetite. 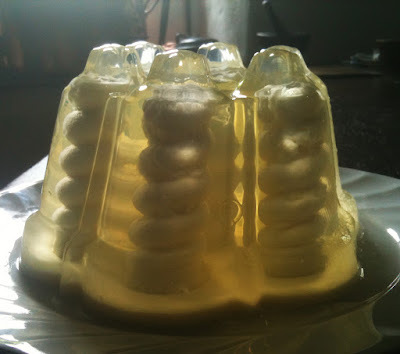 How the heck did they get the spirals of cream into the Victorian Belgrave jelly? Amazing article. Thanks for sharing all these wonderful things. P.S. A hair sieve? Shudder. This of course means a horse hair sieve not human hair! No nylon back in the thirties. Horse hair is very strong and durable. I still use one. How do you get the fruit slices to stick to the sides before everything's set?